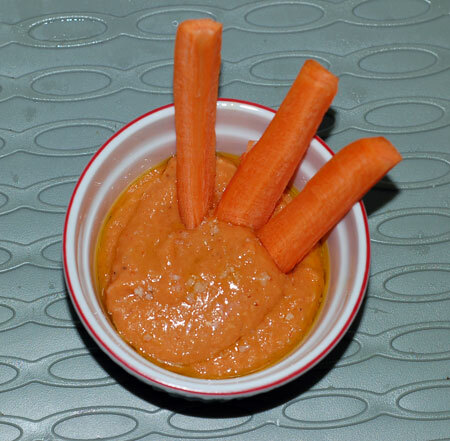 I was planning on making soup for dinner last night, but when I walked in the door, red pepper-bean dip with carrot sticks was what sounded good. So I cracked open a can of cannellini beans and thawed a few peppers, and whipped myself up some dip in no time flat. I was planning on having that for a snack, and the soup for dinner later, but I ended up just eating more dip. Think I worked my way through about 4 carrots. Super yummy, but I need my husband/taste tester back now please. I thought I had made this recipe before, but it turned out what I had been thinking of was something similar with sundried tomatoes. That was good too, and I bet you could sub some sundried tomatoes into this recipe. I used peppers that I roasted myself; I keep them in the freezer, individually wrapped, and thaw them very briefly in the microwave as I need them. For speed and convenience, I used jarred garlic and bottled lemon juice; and I was heavy-handed with the salt, garlic and olive oil. Store leftovers under a thin layer of olive oil to keep it from drying out; the flavors with further develop with a rest. I like this dip both straight from the fridge or at room temp. For me, the carrots have to be as cold as possible, though; I slice them into sticks and store them under water in the fridge. Place all ingredients except olive oil in food processor and blend until very smooth. Add olive oil in a thin stream until desired texture has been achieved. Sample and adjust seasonings to your tastes. Serve drizzled with olive oil and sprinkled with fleur de sel, alongside raw veggies (carrot sticks are my favorite) and crostini or pita. Source: Adapted from Cooking Light. Update 8/17/07: Last night I made a batch of this dip to snack on, and it turned out great. I think I had better peppers this time, organic ones from LifeSource that were a lot more flavorful after roasting. I used balsamic this time also, and it really enhanced the natural sweetness of the peppers. Yum!